Truly superb... a sophisticated psychological thriller. Feeling lost and disconnected, with no family of his own, veteran Sherman Oliver sets out to the countryside in search of the soldier who saved him back in the war. That man, Franklin Page, has long since moved on - to a wife, two children, and a reliable job in a quiet, rural town. Upon arriving, Sherman seems at first a harmless, if awkward, shell of a man. But as he inserts himself further into the Pages' lives, he reveals himself to be an angry, unstable individual prone to great jealousy and deep resentment. The stability Franklin worked so hard to establish is soon threatened, and the violence he believed he'd left behind in the war begins to re-emerge and cloud over both the household and the town itself. Writer/director Ryan Redford. Photo by Michael Gibson. Sherman Oliver (Garret Dillahunt). Photo by Antonio Calvache. Irene Page (Molly Parker). Photo by Michael Gibson. Left to right: Jacob Page (Kaelan Meuiner) and Sherman Oliver (Garret Dillahunt). Photo by Michael Gibson. Sherman Oliver (Garret Dillahunt). Photo by Michael Gibson. 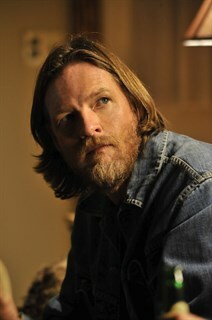 Franklin Page (Donal Logue). Photo by Michael Gibson. Left to right: Franklin Page (Donal Logue), Sherman Oliver (Garret Dillahunt), and Irene Page (Molly Parker). Photo by Antonio Calvache. Left to right: Franklin Page ( Donal Logue) and Sherman Oliver (Garret Dillahunt). Photo by Michael Gibson. Left to right: Irene Page (Molly Parker) and Franklin Page (Donal Logue). Photo by Michael Gibson. Left to Right: Franklin Page (Donal Logue) and Sherman Oliver (Garret Dillahunt). Photo by Michael Gibson.